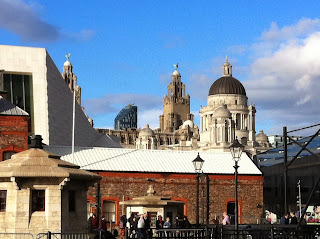 Liverpool, iPhone image, definitely not by Tim Hetherington! 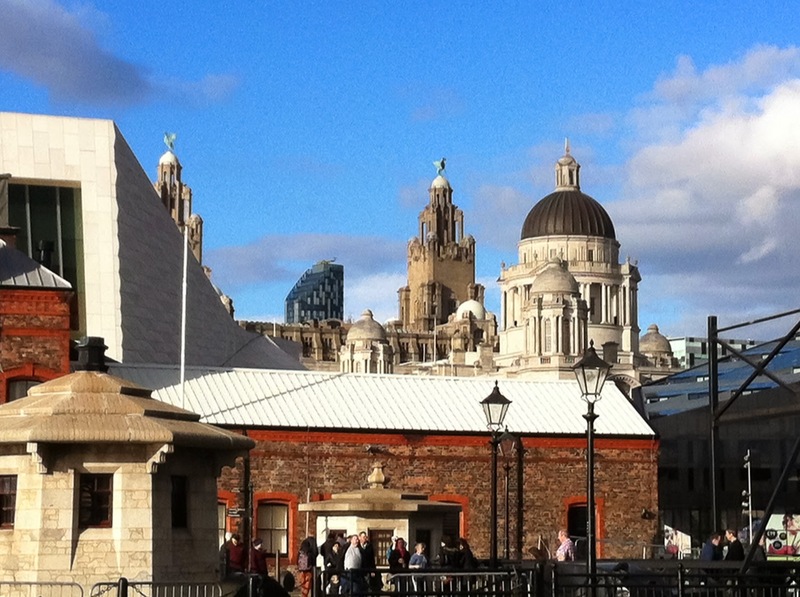 On Saturday, I attended an OCA Study Visit to the Liverpool Open Eye Gallery, where there is an exhibition of the work of conflict photographer, Tim Hetherington, who was killed whilst working during the Libyan conflict, in 2011. The show is entitled 'You Never See Them Like This' and comprises still images, video and audio visual presentations taken mainly from his book, 'Infidel', published in 2010 and originating from his time embedded with American troops in the Korengal Valley, Afghanistan. I am not, let me say from the start, greatly interested in or by war photography; and studies and reflections on truth and photography leave me with a degree of cynicism and concern about the genre of documentary photography - so I went along to the gallery expecting not to be particularly moved or inspired by what I saw. In the event, whilst that basic assumption turned out to be broadly correct, there was more to take away from it than I had expected and I'm glad that I have seen it. The exhibition is in three rooms. In the first is a series of still images that provide a hint of the context but are chiefly about the young soldiers away from actual conflict. They may be wrestling with each other; displaying unexplained wound-like marks on a bare stomach; slouched in full combat gear, clearly utterly exhausted; or curled up on small, uncomfortable-looking beds, fast asleep - but they are not, in these images, engaged with 'the enemy'. One shows a roughly cut wooden outline of a 'well-endowed' naked man, propped at what looks like a sentry post or look-out point. There are no captions with any of these images, and so we are left to read them as we see fit. The second room is devoted to an audio visual display comprising three sizeable screens, side by side, the centre of which mainly displays a series of further still images of 'Soldiers Sleeping' (the title of this piece), whilst the outer screens, and the accompanying soundtrack, show images of the men out on patrol, or of shell/rocket fire onto hillsides. In one sequence, a soldier is confronted with the news of his friends death and we see/hear his distress and despair. There is no text or commentary; we have only the images and the soundtrack; and we are left to draw our own conclusions, respond with our own emotions. The third room has further stills of the young men away from conflict - almost always tightly framed images of more than one person, in close proximity, playing video 'games' on child-size plastic guitars, leafing (with no great enthusiasm) through magazine photos of naked women. There are some close-ups e.g. of a tattooed arm, of a bullet lying on the ground in a strange red light - and more of young men 'larking about' e.g. one with a handwritten sign 'I love you' held in front of his face. Again, there are no captions, but also in this room is a TV screen displaying Hetherington's video 'Diary' - a loosely assembled montage of stills and moving images, with soundtrack, providing a kind of 'stream of consciousness' narrative of the nature of his life as a conflict journalist. There is, I should mention, an introductory text board at the start of the exhibition, in the first room, and a short video, that includes Hetherington himself speaking about his work and comments from some of his friends and associates. · My impression - based partly on comments in the introductory video but also in response to the images themselves - is that Tim Hetherington was genuinely trying to do something different here. He more or less said that he was not interested in photographing the conflict but in capturing what it was like to be a group of young American blokes spending this time, together, in a combat zone. That might partly have been a response to the restrictions associated with the policy of 'embedding' journalists, but the outcome, for me, was a more interesting and more human piece of work. I was left, strangely enough, with the thought that images resulting from a period 'embedded' with an urban 'gang', or even with the local football club, might have produced a not dissimilar set. It isn't necessarily a particularly surprising outcome - that these young men share many similar characteristics with other young men - but it is, perhaps, worth saying in the context. · There have been suggestions that the photographs of these soldiers sleeping lends them a kind of innocence. That I didn't see and don't accept. They did not come across as any more or less innocent than any other group of their peers. We never see 'the enemy' and we never see the global or local context of the conflict in which they're involved - so, in that sense, they are presented as 'innocent' of what might be perceived in some quarters as brutal acts of international bullying, meddling or whatever - but taking this exhibition at its face value, they are not innocent, just normal. · I referred to the lack of accompanying text earlier; there are no captions, titles, or anything with the still images. It was very clearly the intention of the curators to allow viewers to respond to the images in whatever way they chose - a sound approach, I'd say, in this case. It does encourage the viewer to dwell on their visual and emotional response, I think, rather than focussing on a particular narrative directed by the photographer or curator. · The 'Sleeping Soldiers', audio visual piece was the outstanding work, for me - and clear evidence that Hetherington was working with a broad range of media and techniques. This was confirmed by his colleagues speaking in the introductory video, who suggested that he was ahead of most others in his thinking about conflict image-making and presentation, with, probably, plenty more to deliver when he was killed. Which leads to another thought - the iconic status that an early death brings to artists; rock and pop musicians being the classic, but not only, example. Would this exhibition have been different if he was still alive? Well it would obviously have had more input from him - but would it have taken place at all? How is our reading of his work changed by his death? Do we judge it more or less harshly? One hopes it might make no difference, but I sense that it does. For one thing, there is an end to his oeuvre, a completeness, a box of work to look at and form a judgement, uninterrupted by new and ongoing activity. It probably doesn't make a huge amount of difference, but it inevitably came up in discussion on Saturday. · But also inevitable, I guess, are questions about the whole genre of war or conflict photography. Is it necessary? What does it achieve? How meaningful is it in the context of 'embedding'? Is it sometimes more about the photographer than the message/subject? As I said above, it has never been an area that greatly appealed to me and I could easily take the more 'negative' line in responding to all these questions. This exhibition didn't change any of that - but then I'm not entirely sure I would classify it as 'conflict'. What it did change, I think, was my view of Tim Hetherington. Presented in the media as a war/conflict journalist of high standing and bravery, somewhat glorified after his death, he had, I admit, seemed like an 'alien' type of artist to me. That was wrong. Better informed and having seen his work at close quarters, I can see that he was a thoughtful, creative and caring individual - addicted to conflict, yes, by his own admission; inevitably sanctified by an early death, yes, probably; but deserving of the praise and respect that others have bestowed on him, yes, I think so. My last post on Assignment Three was way back in April - here - when I'd just spent some time making further improvements to my video response to Paris Photo 2012. I did get some further helpful comments from my tutor, but had simply had enough of the assignment by that stage and decided to leave any further work until I was getting ready for assessment. Jesse felt that it was definitely stronger, but that there was still too much movement; that the use of an image of 'Leeds Market' was a bit 'too obvious'; and that the shot of the fish on a stall, which had previously looked rather like it had dropped in by accident, was now on screen for a bit too long. Looking back at the video some months later, I can agree with all those points; and I also felt that the start was a little too abrupt, with the 'coin drop' sound coming in more or less immediately at 'play'. So, I've made a few more amendments and the latest version is here. Whilst awaiting feedback on Assignment Five, I've spent some time thinking ahead to work that needs doing before my Assessment Submission. I've got in excess of three months before then, but there are a few jobs that can usefully be dealt with. 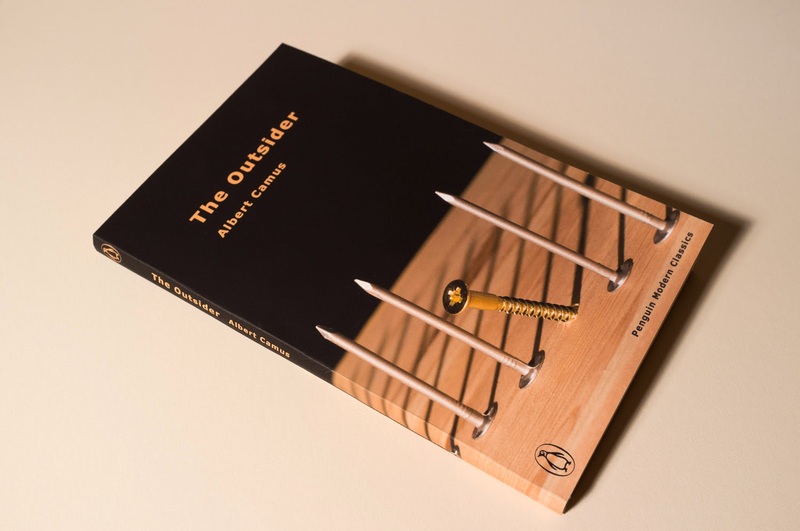 One of those was to go back to Assignment Two - my book cover for 'The Outsider'. The original feedback was very positive, so there doesn't appear to be much more to be done to improve the image itself, but I decided to 'mock-up' my own version of the book, using an old copy from my own bookshelves. So, the version illustrated above now has the original 'blurb' from the back of the jacket; and I've added 'Penguin' logos to the front, spine and back - sized and coloured to work with my design. It seems to work well and I'll make it part of my final submission next year. 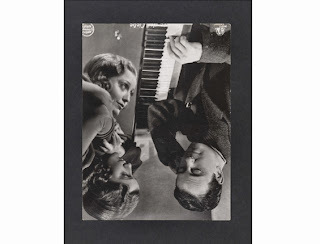 My very first thought was of 'collage/montage/inversion' and a link to John Stezaker, about whom I had written only a few days earlier - here. It isn't collage, of course, as I could quickly appreciate, but the connections were underway! And, collage or not, the juxtaposition of two seemingly dissociated 'images' to arrive at a new meaning is certainly in line with Stezaker. 'The Universe Next Door', a recently published monograph, largely picks up the story of Morell's photography from 1986 onwards. He was 38 by then, a father for the first time; was teaching photography, with a Masters from Yale; and must have had some seriously formative life experiences since being born in Cuba, seeing his father arrested by the post-revolutionary government, moving to New York (with little or no English) at the age of 13, and studying under Tod Papageorge at Yale - to mention just a few. But 1986 seems to have seen a significant change of direction. In a sense, he came indoors, from street photography, to create different, more thoughtful, more contemplative, more experimental images. He accredits the change to becoming a father - both from an attitudinal viewpoint (seeing the world through new eyes) and from a practical one (spending time caring for his new son). 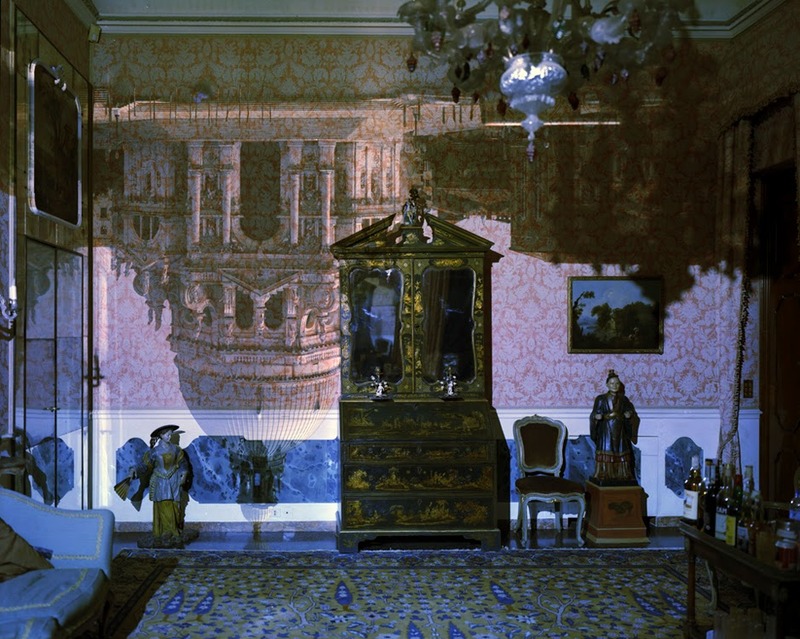 Since then, as is illustrated in the book and on his website, his range has included images of books, artworks, museums, 'still life', photograms, paper cut-outs, as well as the camera obscura and its more recent descendant, his 'tent camera'. What comes across very strongly to me, as a student of, and late-comer to, photography, is an ever-present enthusiasm and fascination for the process of photographic image-making. All these images seem to interrogate the medium, probing and seeking out the possibilities. So, in that respect, there is an intellectual quality to them. But at the same time, they are interesting images in their own right - as though there is something for the casual beholder as well as the curator and the academic. These two, quite different, examples demonstrate the point. Light Bulb, 1991 was created to illustrate the optical principles of photography to his students (and to delight them in those principles, too, as with the camera obscura). I like the use of a crude cardboard box on an old table top - the 'homely' physicality feels close to some of my own efforts in the last few months (here). Yet the image appeared in a poster and brochure cover for MOMA in 1992. That seemingly simple, homemade set up has something fundamental to say about photography's ability to transform and re-present. 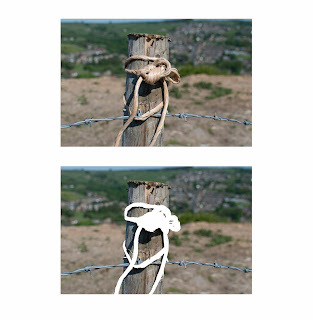 Likewise - albeit in a very different way - Nadelman/Hopper, 2008. On the face of it, another apparently simple juxtaposition (of two artworks) - but the 'magic' of the photographic transformation, the careful framing and lighting, produce an image that is both attractive in its own right but also open to multiple readings. 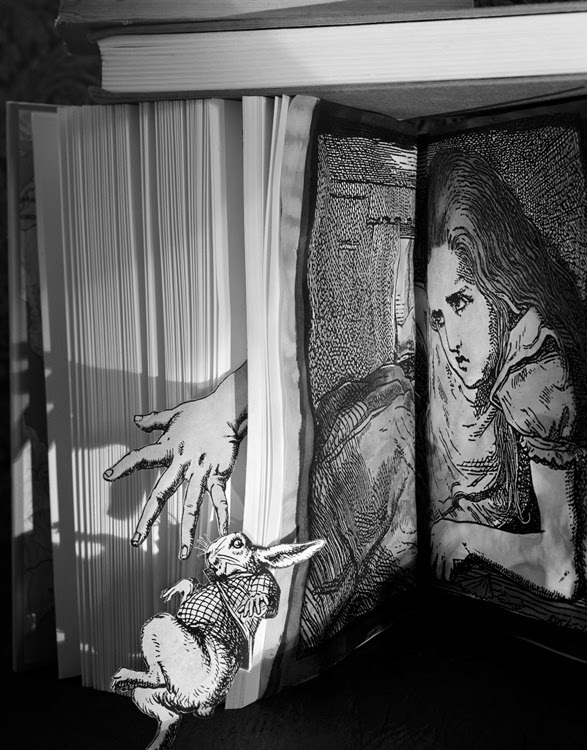 Looking at the 'Alice's Adventures in Wonderland' series, I can feel the physical delight in cutting, copying, resizing, cutting some more, juxtaposing, assembling, lighting, etc ... and then, eventually, seeing that finished outcome - turning out, perhaps, even better than he expected. I had thought about attempting to create three-dimensional 'assemblies' for my own assignment and this encourages me to go back to that idea at some stage. 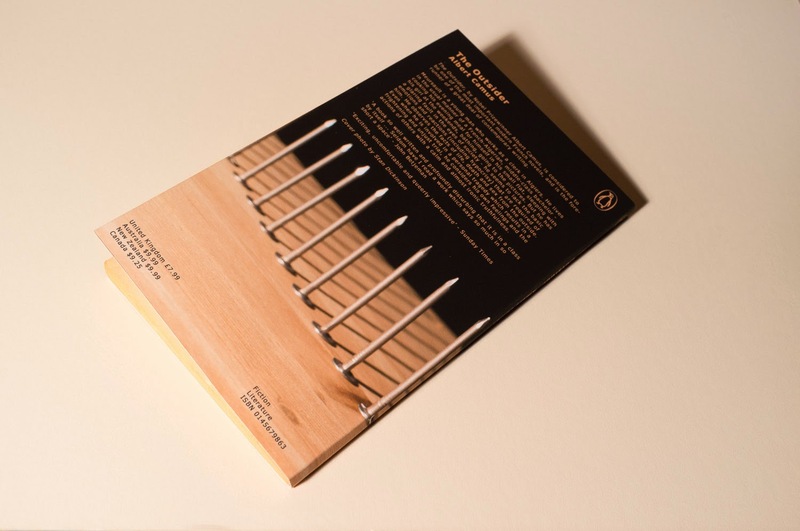 However, one can respond to the process of creating these images in a broader and more fundamental way. These may be illustrations for a children's story, but they confirm to me the immense scope that exists for experimentation in different manners of 'photographic' response to the world around us. 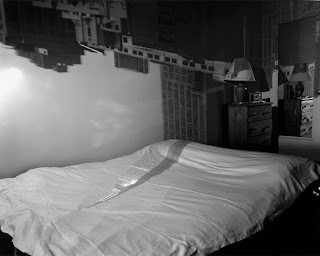 Abelardo Morell's own experimentation has taken him on to the 'tent camera', a moveable camera obscura equipped with periscope, prisms etc, that has enables him to go out into the landscape and create images of the world projected onto the ground within the tent. So, once again, two very different images/elements are combined to seek a new meaning. Interesting as they are, I feel less of a personal response to these images - truthfully. They have something painterly about them, which Morell himself identifies; and there is a possible reference to pixels in some, such as above. (He does now use digital methods.) But most significant of all, for me, is the ongoing desire to explore the possibilities and the different ways in which photography can look at the world - 'The Universe Next Door'. 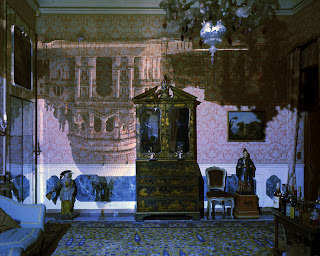 In her introductory essay in the book of that name, Elizabeth Siegel, Associate Curator in the Department of Photography at The Art Institute of Chicago, says that "... Morell has watched developments in contemporary photography with interest and has at times, he says, felt like a defender of photography to those who proclaim its demise." She goes on to say that, "He maintains his belief, even in the present age of digital convenience, that the photograph must be worked for and earned; he continues to delight in conceiving pictures and laboring towards their execution." Coming as I do, from an entirely digital introduction to photography, I sometimes wonder whether I have missed out by not pursuing the detailed exploration of its original methods. 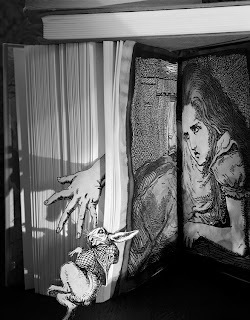 Chances are that many - perhaps including Abelardo Morell (and certainly some OCA tutors!) - would say that I have. But I have neither the time nor feel the inclination to do so at present and, crucially, it is in those notions of 'working for' and 'earning' the image that the key lessons lie here, whether it is executed by digital methods or any other. It is good, as a student (even a decidedly mature one), to study artists that are new to one and to feel some sense of connection with what they are doing and their approach to their art. There are reassuring, inspiring and, also, challenging connections in looking at Abelardo Morells work, and I will continue to look in more detail as I press on with my own journey of exploration through the medium of photography. I'm tucking this away as an anecdotal 'postscript' to avoid any idea that it is anything other than a light-hearted reference to my own work in the context of Morell. But - I couldn't help recalling some photographs that I made almost seven years ago, a few weeks after acquiring my first digital SLR camera. Having played with it for a while, I made myself put the camera on a tripod, turn the dial to 'Manual', point it at a few 'objects' on an old table, and begin to think more carefully about what I was doing. 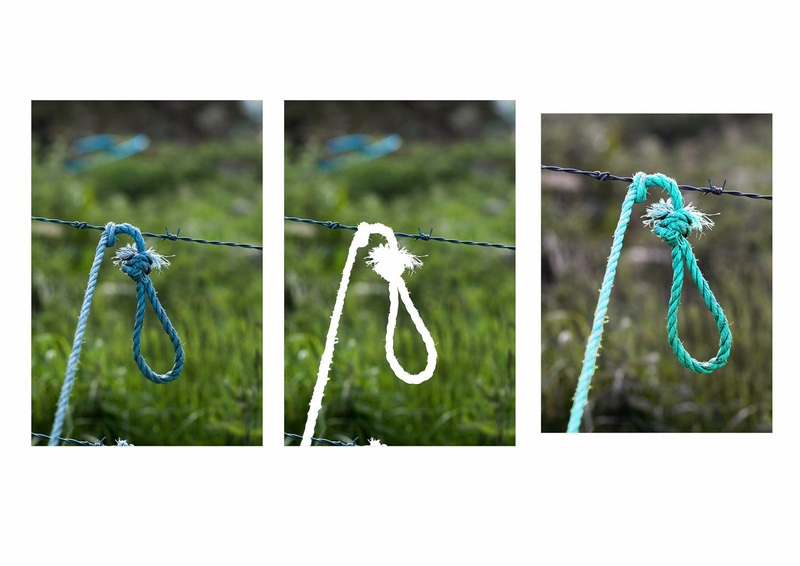 Honestly, these are two of the first 'thoughtful' photographs that I made! Back in June, I did some work on a Project that I tentatively titled "Tied". It was linked with Assignment One, and I blogged about it here - http://stansocapwdp.blogspot.co.uk/2013/06/tied-project-derived-from-assignment-one.html. 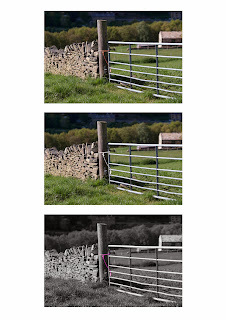 What started as a documentary-style project about the methods used to tie field gates in my immediate area - albeit one with symbolic possibilities - became, like many projects that I've looked at lately, more about the process of producing photographic art than about the subject matter (albeit, that subject matter remains in place). I did more work on it at the time but then got sidetracked into other things. Since these images might well form all or part of my final submission for Assignment One, I've been back to it again in the last week. 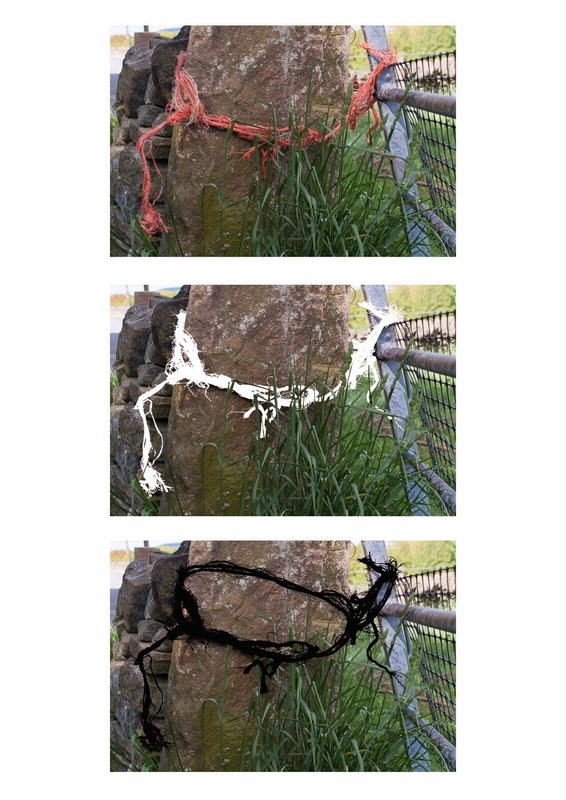 · It certainly stems from a documentary-style interest in this phenomenon of tied gates and an inclination to record them. · But, finding myself thinking about whether the subject would be better photographed in sunlight, even light, low sun, or whatever, I came to realise that I was actually getting (overly?) 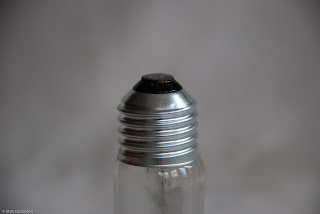 concerned about the 'craft' aspect of the photographic process - as much to do with what others might think as it was to do with my own aesthetics or interests. 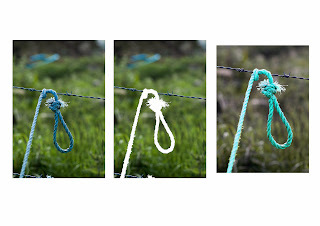 · This coincides with the Assignment Four research on Still Life and the transparent image processing of Lucas Blalock (who, by coincidence, often includes rope, hoses etc in his images). 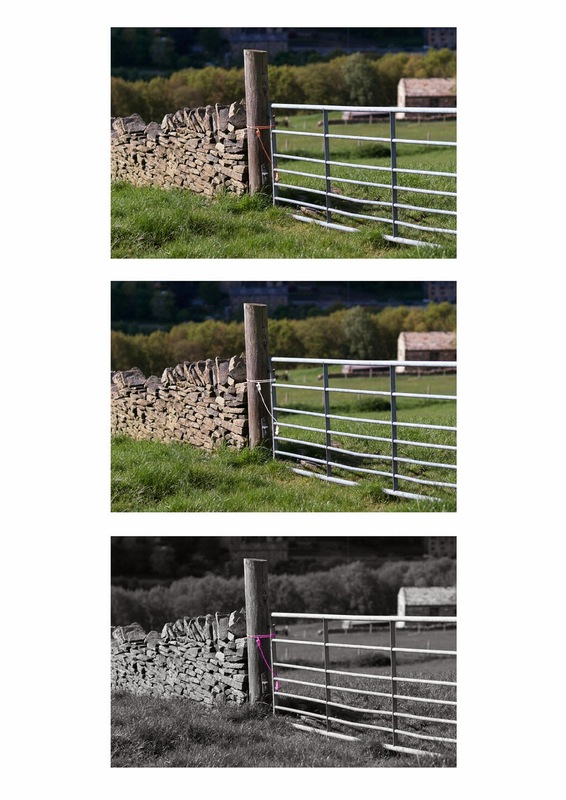 I began 'playing around' with the images in Photoshop, leading (and some Mishka Henner influence to be acknowledged here) to the idea of completely removing the very subject I'd set out to photograph. 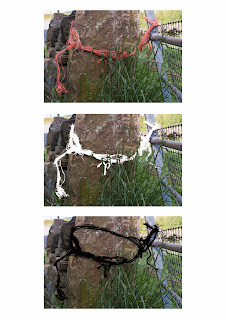 · In some cases, that processing went further, highlighting the strings, ropes etc in different ways. 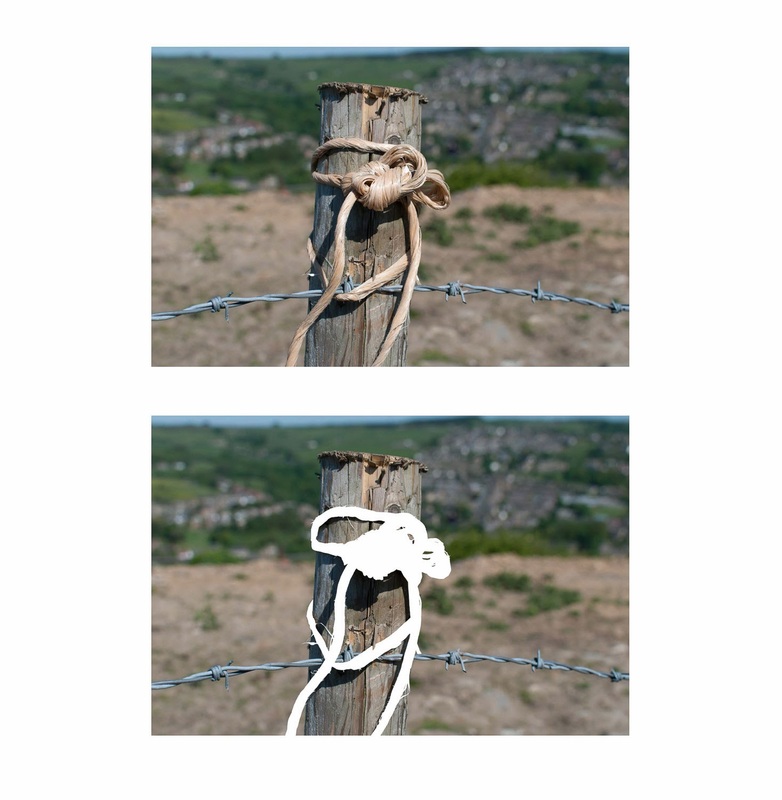 · Finally, with one image, where, as one would expect, the string passes out of sight behind a gatepost, I came up with the idea of 'creating' an image of what couldn't actually be seen in the original image. 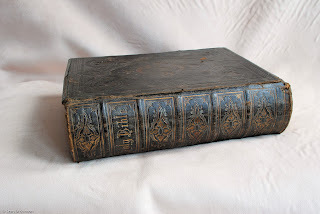 · And so, the images have probably come to be almost entirely about the presentation of any subject matter in a photographic image. They deal with the issues of truth and reality in photography, and with the layers of influence and decision-making in the process of making photographic images - in a not dissimilar way to my series for Assignment Five. I've been thinking about how they might be presented and have explored the idea of combining different version/stages together. There are four examples below. Presentation needs a little more thought & I would need to process some of the other images in a similar manner, but I'm quite interested in the way these explore, and maybe question, the extent to which photographic image-making plays with truth and reality. Maybe? Since Assignment Five went off to my tutor, I've been taking some time to look properly at the work of John Stezaker. His collages have partially informed my own work for Assignment Five; plus I saw, and really enjoyed, a significant exhibition of his work in Arles a couple of months ago (blogged here); and on returning from Arles, I got the book that came with his Whitechapel Gallery Retrospective in 2011 - John Stezaker. The image above isn't a collage, of course; it's an inverted image - a film still. He tells the story of how his wife acquired it for him in the early 1970s, when he was beginning to collect such images. It was upside down when she handed it to him and immediately made an impact on him. He says that it sat, upside down, on the piano music stand, for five years, before he could be sure that inverting it in this way might be regarded as art. Oh, the angst of the creative process! I can see why the image haunted him - it has an unsettling effect on me, too. It is an excellent illustration (albeit not a typical one) of the way that Stezaker intervenes with images and explores (as he puts it) the 'after-life of the image'. How can you be an artist in a culture of images? Images that are already in the world are so much more fascinating than anything I could create. Could art be just finding and taking out of circulation? Thirty years on, the answer seems to be a resounding 'yes' as he has built a highly successful practice on the 'found' image. But also interesting to reflect back to the research for my Assignment Four essay and the concerns of some younger contemporary art photographers - such as Lucas Blalock saying that everything may have been photographed - and artists such as Mishka Henner (blogged here) working with images from the internet. I also think of a quote from Laura Letinsky that I used in my essay, to the effect that her more recent work (in which she also uses existing images) involves letting go of photography's promise. 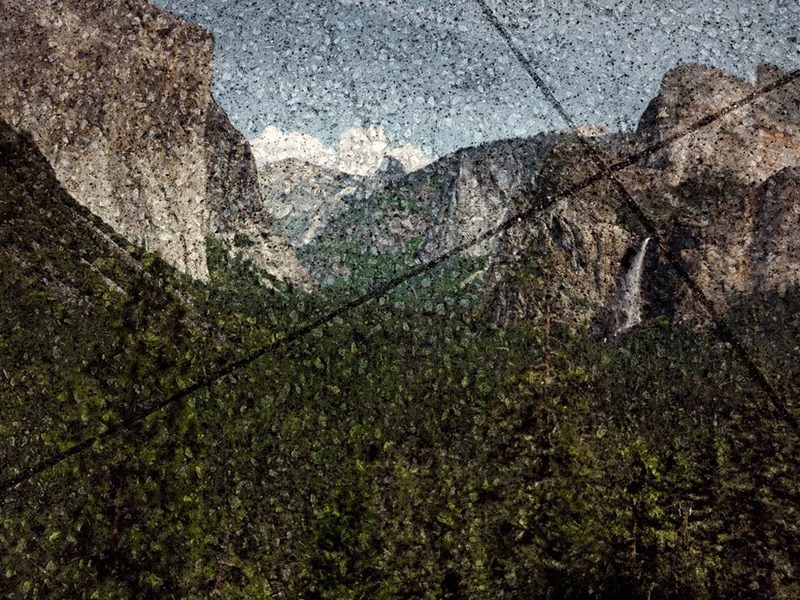 It seems that Stezaker has, for the last thirty years, been letting go of the photographic image's promise. As Michael Bracewell puts it in an essay in the book linked above, he does so "... through a succession of interruptions and interventions that disconnect the image from its referential bearings". In an interview with Stezaker, in the same book, Daniel F, Herrmann suggests to him that "meaning seems to germinate in between the cracks" of his images; and Stezaker replies that "It is those spaces that excite me". There are several references to him creating a space in which the after-life of these 'rescued' images can be contemplated. That, in turn, reminds me of another Letinsky-related quote that I used. Duncan Wooldridge said something to the effect that she is exploring a pictorial space outside of regular temporality. Stezaker, of course, has worked extensively with film stills, which he describes as having "temporal ambiguity" (because they are pretending to be something there are not - not in fact frames from the actual movies, but posed, staged imitations of a moment in the narrative, making them, perhaps, more like paintings than anything else ...). So, why am I stringing together these disparate quotes and references? It is because I feel myself to have been caught up for most of this year in this swirl of time and space questions, together with my earlier 'angst' about what I was doing with my own photographic image-making. Stezaker's 30 year old concerns about an artist's potential to create meaningful images in an already substantial flow of existing images feels somehow reassuring. My research for Assignment Four was also reassuring, to an extent; and, though I await feedback on my Assignment Five images, that work has taken me a little way into similar areas - and it has been enjoyable & rewarding. I haven't pinned down exactly what is going on in this fast-flowing deluge of 21st century imagery - in fact, just the opposite, I've begun to accept that there is no pinning-down potential whatsoever. Perhaps I am, at least, learning to swim and stay afloat - from which position one can observe what is going on around.